Andrew & Adrienne Gill dance with artistry & elegance, beautiful connection and creative choreography on stage. 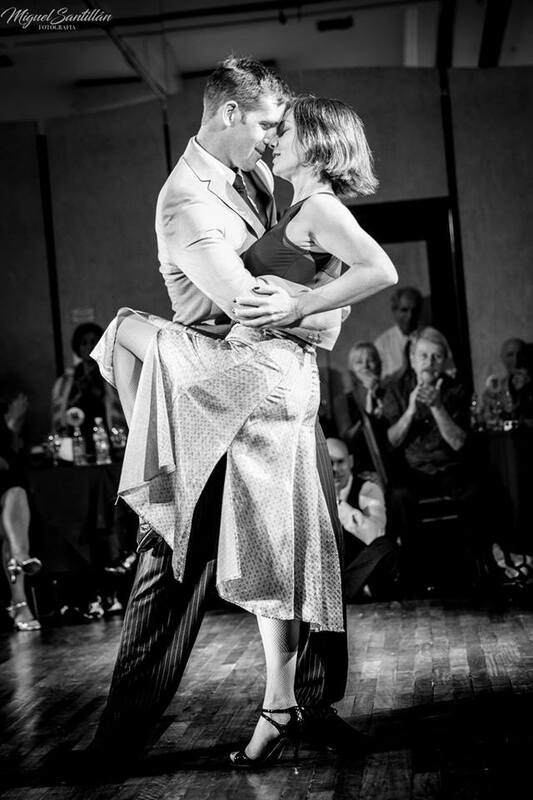 With many years of experience in the dance industry, Andrew & Adrienne Gill are highly respected performers and teachers of Argentine Tango, and dynamic organisers of tango events in the community. Original pioneers of tango in South Australia, Andrew & Adrienne Gill established Southern Cross Tango Argentine Tango Dance School in early 1999. Their engaging, encouraging and innovative teaching style trains their students in improvisational creativity, choreographic skills, precise yet beautiful technique, musicality and rhythmic skills, and a harmonious and dynamic movement quality inspired by a contemporary approach. In 2015 and 2018 Andrew & Adrienne Gill were honoured to join the faculty of maestro teachers at CITA, the ‘Congreso Internacional de Tango Argentino’ held in Buenos Aires, Argentina, teaching and performing alongside some of the most fascinating tango artists working in the world today. During 2017, Adrienne & Andrew Gill performed at the Adelaide Festival of the Arts in 'Argentine Tango Milonga' with Tangalo quintet, in 'Opera Tango' with Italy's Massimo Scattolin and Alessandra Cantin, and Simone Slattery at Mildura Arts Centre, and in Hobart Tango Encuentro. In 2015 Adrienne & Andrew Gill were recipients of an Arts SA Government of South Australia professional development grant to further their development as international tango artists, and continue to enrich the local community with their unique skills in tango dance and teaching. Adrienne and Andrew have performed and choreographed for Leigh Warren & Dancers, Victorian Opera, State Theatre of SA and State Opera of SA. Renowned for their creative collaborations with international classical musicians, Andrew and Adrienne have performed with Italy’s Massimo Scattolin, Mirko Satto and Alberto Mesirca, and Australia’s Slava and Leonard Grigoryan, Jose Carbo and Anthony Halliday. Adrienne and Andrew have shared the stage with Argentina’s greatest tango dancers such as Milena Plebs, Demian Garcia and Alejandra Mantinan, and performed multiple times in Buenos Aires. Andrew Gill was lead tango dancer in the Leigh Warren Dance production of ‘Maria de Buenos Aires’, performed in Melbourne Recital Centre, OzAsia Festival, and Brisbane Arts Festival. Together Andrew & Adrienne Gill are feature dancers in 'Opera Tango' company directed by Massimo Scattolin, and in ‘Jose Carbo – My Latin Heart’ company with Slava & Leonard Grigoryan, with seasons performed in Melbourne Recital Centre and The Playhouse Theatre, Adelaide Festival Centre. Adrienne Gill appeared in short-film ASHA, in the lead acting role alongside Brendan Rock, Doughie Mowbray and Amy Brooks. Asha was written by Rob George and directed by Dan Bradley, and was premiered in the Clare Valley Film Festival 2015. Together Adrienne and Andrew Gill have made various television and film appearances, including ‘Human Touch’ directed by Paul Cox, and short art-house film ‘Take Photographs, leave footprints’ for SALA Moving Image. Andrew and Adrienne Gill’s early years of tango development as a professional couple were strongly influenced by intensive training with maestros Julio Balmaceda and Corina de la Rosa, Milena Plebs and Ezequiel Farfaro, Gustavo Naveira and Giselle Anne, and Demian Garcia, dancers whose significant investigations into tango methodology has led to the most innovative changes to tango teaching approaches and practice throughout the world. Andrew and Adrienne Gill are the directors & producers of ‘Buenos Aires in the Vales’ Tango Festival, and have created and performed in tango productions for arts & tango festivals around Australia, in Buenos Aires, New York and Los Angeles. Their collaborations with dancers, musicians, artists, writers and poets has brought the tango arts to a new generation of people. Andrew and Adrienne’s many performances include festivals such as CITA (Argentina), Adelaide Festival, Womadelaide, Adelaide Cabaret Festival, Los Angeles Fireworks Tango Festival (USA), Hobart Tango Encuentro, Buenos Aires in the Vales Tango Festival, Buenos Aires at the Beach Summer Tango Festival, Sydney International Tango Festival, Canberra International Music Festival, Organs of the Ballarat Goldfields, Murray River International Music Festival (regional Australia tour) Australian Tango Festival, New Jersey Tango Extravaganza (USA), Adelaide Fringe, Perth Fringe, Cabaret Fringe, Winter Tango and Melbourne Spring Tango Festival. Adrienne Gill is a tutor at Flinders University Drama School, training new generations of young actors with tango movement skills to enhance their acting practice. Adrienne has also been a dance tutor in schools for Ausdance SA. Andrew and Adrienne Gill are highly sought after teachers, regularly selling out their ‘Caminito’ Intensive Tango Day Seminars, currently offered in Adelaide and Geelong several times a year. In their home town of Adelaide they present regular tango classes, courses & private tuition, practicas & social dancing events such as Adelaide’s most popular Milongas ‘Tango by the Sea’ & ‘La Calesita’, and sponsor the ‘Community Tango in Geelong’ outreach program in Victoria.